This march, the USAC National Climbing Championship is getting a healthy dose of Edgeworks. 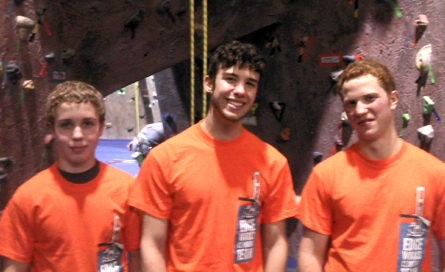 Our very own James, Alex and Ben had an outstanding bouldering season and have been invited to compete nationally. Coach Jon Manz has done an awesome job with our climbing team with respectable showings at regionals and divisionals. Now we're looking forward to a strong performance at the national level. Be sure to congratulate Coach Jon and the rest of Team Edgeworks next time you're in the gym. We're heading to the USAC National Championships! We couldn't be more proud of Team Edgeworks. These young climbers have shown a dedication and passion for climbing and their efforts are clearly paying off! With a strong showing at regionals and divisionals, we're sending three of our climbers off to nationals. To help offset various team costs, Edgeworks is holding a fundraiser to support our team. During the month of February the route names are up for grabs. You pick the route, you pick the name*. It's that simple. Use this opportunity to ask that cute girl out, tell your funny joke, or kick-off your presidential campaign! Minimum donation of $5.00. All proceeds go to support the Edgeworks Climbing Team. Details at the Front Desk. *Obviously, we reserve the right to deny offensive route names. If you’ve got a Military I.D. or know someone who does, join us for Military Mornings. Every FIRST FRIDAY and THIRD THURSDAY Edgeworks will open at 6:00 a.m. for military and their friends and family. Join us for reduced day passes, which include FREE gear rental. We'll also have an early-morning belay class! Day Passes $15 includes gear rental! Intro to Climbing Class $25 includes gear rental & Day Pass! Third Thursday Feb 16, starting at 6:00 a.m.
* Extra Session* Feb 23, starting at 6:00 a.m. This month's Crushing Tip might be the HARDEST one EVER! For climbers, taking a break can be tough. We're just so ready to push the route, ourselves, and our bodies to the next level. But remember, rest is your friend. "Once you've figured out the moves on a boulder project, it's easy to get excited and try over and over again without resting," says Jon Manz. Inadequate rest will pretty much guarantee that you will fall off, kick your chalk bag in frustration and tell me you hate climbing." Once you've transitioned to redpoint burns, try resting 1 full minute for every move you made on your last attempt. Long problems might require as much as 10 minutes, while shorter problems or attempts may only require 2 or 3. Taking a adequate breaks between burns (as well as climbing sessions) will help your body maximize it's climbing ability. Subscribe to the Edgeworks VIP by texting the word "edge" to 53535 and get all the latest Edgeworks insider info like deals and sales. If you haven't yet, text us now for a FREE DAY PASS! We re-titled Couch 2 Climb to better represent it's offerings: ProRock Sessions is a weekly coaching program for new climbers who want to move quickly into climbing super stardom. Every Thursday at six. More info here. Our Climbing School has undergone a bit of a change. To see all the new classes, click here.